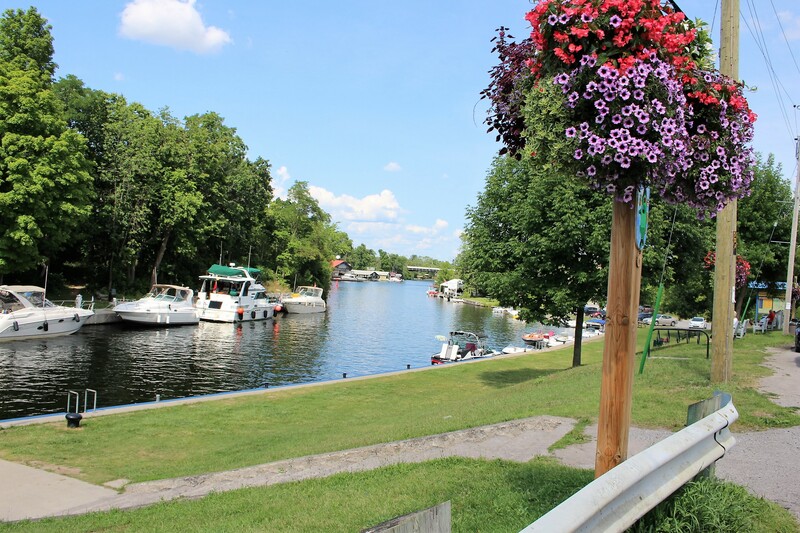 We Give You Bobcaygeon, Ontario. Come and Visit!! Beautiful Bobcaygeon Ontario. During the summer months, the small down town area is as busy as the Lock 32 Scene above!! I did not take this pic, above, BUT I did take all subsequent pix. Lock 32 is a lock on the Trent Severn Waterway; the Trent–Severn Waterway is a 386 kilometres (240 mi)-long canal route connecting Lake Ontario at Trenton to Georgian Bay at Port Severn. Its major natural waterways include the Trent River, Otonabee River, the Kawartha lakes, Lake Simcoe, Lake Couchiching and the Severn River. Its scenic, meandering route has been called “one of the finest interconnected systems of navigation in the world”. Go here is you wish to read more: https://en.wikipedia.org/wiki/Trent–Severn_Waterway Lock 32 raises the boats from Pigeon Lake to Sturgeon Lake, or alternatively lowers them from Sturgeon to Pigeon!! ALSO, with respect to the pic at top, notice the blue Bridge. Back to the top pic, this time to look at the boat on the right, with a green awning on top. The Bridge would have to open to allow this boat to pass through. While it slows things down a bit, it is a big part of the appeal of Beautiful Bobcaygeon!! As they leave the lock, they are greeted by this! Despite the many places to tie up, it seems there are never enough. Boaters want to tie up in order to take a stroll down town. What is the attraction down town you may ask?? Have a look at the pic at the very top. Bigleys is the very large store on the left. Women especially are attracted to Bigleys!! 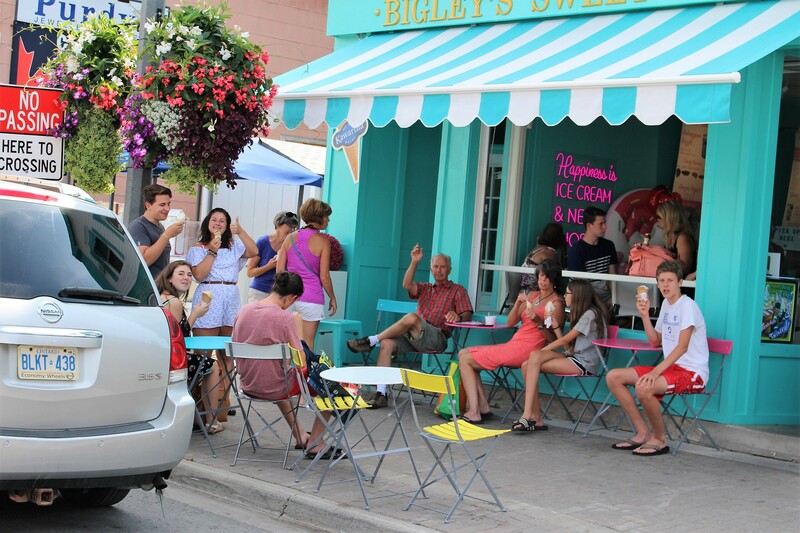 The Ice Cream Store also attracts a great many tourists!! WHY NOT? It is summer after all! It is hot!! 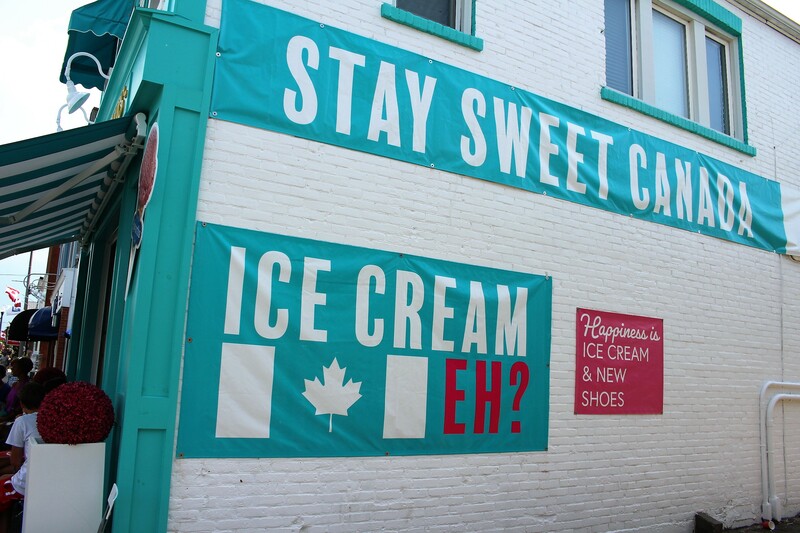 OK, even if you don’t have a boat, maybe the shopping and the ice cream will entice you to visit Bobcaygeon!! Notice that I am holding the two yellow chairs for you!! The flowers you see are hanging on every post, both sides of the main street!! Bigleys too operate the Ice Cream Parlour!! Now we are going to demonstrate that we have VARIETY. 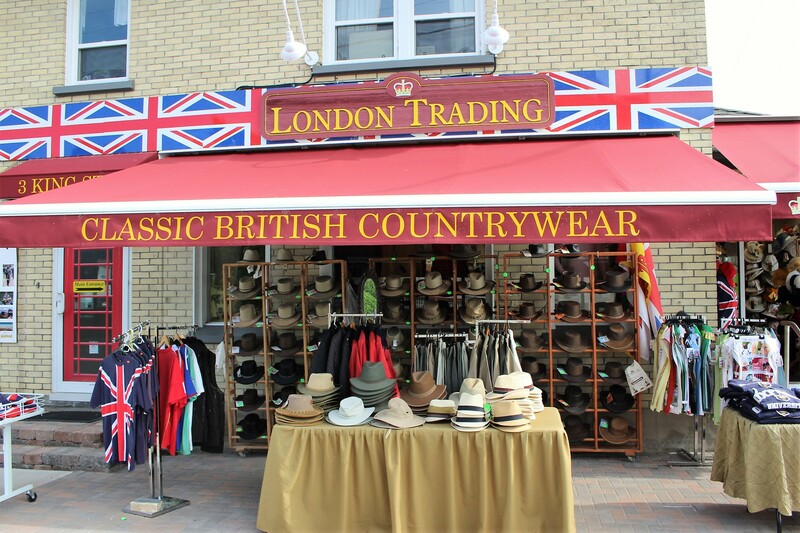 Here is another attractive and appealing store!! We have lots of great restaurants as well!!! Outdoor and Indoor!! AND, WHERE DO YOU LIVE STAN??? 3-47 King St. West in Beautiful Bobcaygeon!! OK, I am now going to leave you. GOING UP FOR AN ICE CREAM CONE!! The outside temperature is 30 degrees. To convert to Fahrenheit, double that and add 30. Stan writing 2018 08 13. 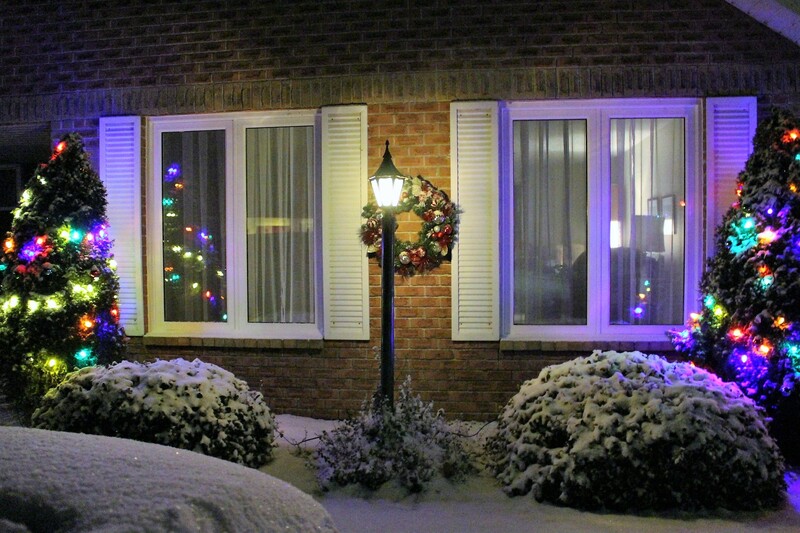 12 Responses to We Give You Bobcaygeon, Ontario. Come and Visit!! We were there on our 39 ft Boat In 2005 and travelled the Trent as part of our 18 month trip from Lake Michigan to FL to New York and the Trent for 10 days visiting all those great little canal towns; great memories. Great coverage of Bobcageon. Many small towns and villages try their best to attract tourists but not many have what “Bob” has to offer. Good choice of places to live Stan. Retirement years are supposed to be like this. Bobcaygeon is a great spot isnt it Gramps! Will be up to see you soon! Bobcaygeon is a lovely town. 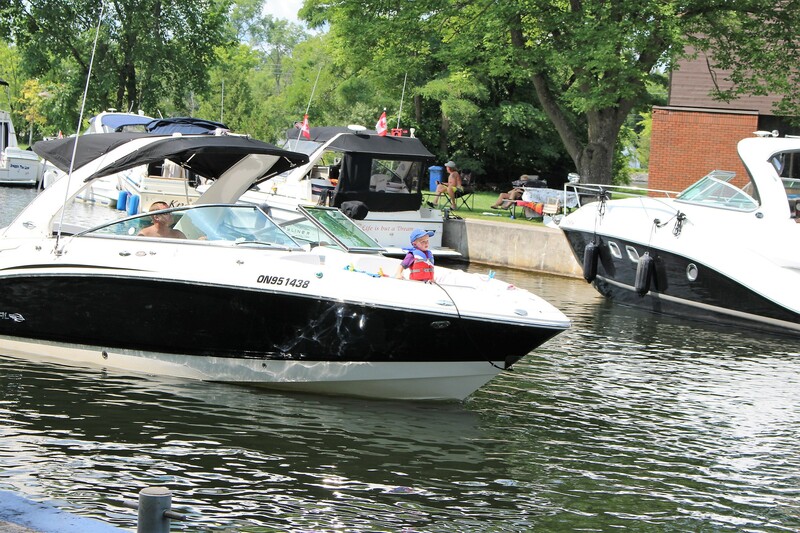 For years we would attend the Fiddle and Step Dance Competition and tour the Trent Severn Waterway. A great place to retire Stan……enjoy and eat lots of ice cream. 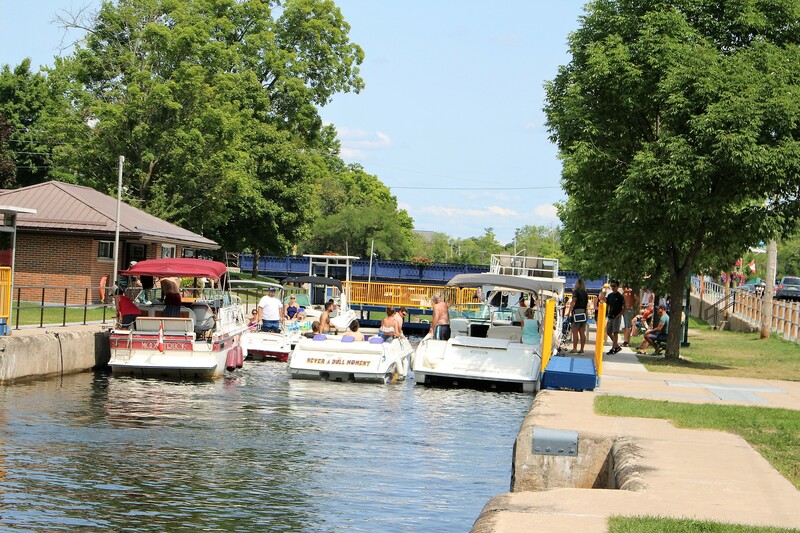 Always enjoyed Bobcaygeon during our boating days in the area. Lovely shops and restaurants. Your place is very nice and close to all the action.